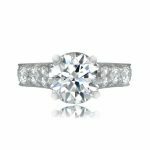 With any engagement ring, the setting of the center stone is clearly the star attraction, but it doesn’t have to stop there. The engagement ring diamond shoulders are also often used to set more, smaller stones, which allows the eye to be drawn both ways and which adds considerable interest to the overall effect. 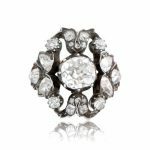 Here, we take a look at some fantastic shoulder designs on vintage and antique engagement rings in our collection. Where else to start but with one of the most famous jewelry houses in the world? Just in case the 1.14ct, prong set, center diamond wasn’t enough, this stunning engagement ring also has 9 more diamonds on each shoulder. The engagement ring diamond shoulders are cut in ever-decreasing sizes to enable their setting into the ever-narrowing band, stopping just short of meeting in the middle. The effect of the shoulders is amazing, instinctively drawing the eye to the center diamond whilst being almost as impressive in their own right. In most settings of vintage and antique engagement rings, the gallery (the area immediately below the center stone) would be considered separate from the shoulders, but in this one-of-a-kind Victorian creation, the gallery and shoulders work together to show the 2.50ct old mine cut diamond at its very best. 18 other antique diamonds are set into the spectacular openwork that comprise the gallery and shoulders, altogether making a unique and very interesting ring! 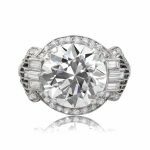 As the past few years have gone by, it’s clear that diamonds are no longer the only game in town when it comes to choosing engagement rings. 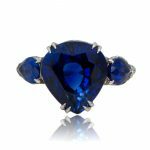 This wonderful example of a sapphire ring shows perfectly why, to some, blue is the new white. As well as a center sapphire of over 9.5ct, other sapphires adorn the engagement ring diamond shoulders beneath a gallery of small diamonds. 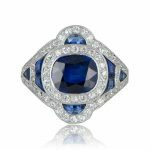 These smaller sapphires would surely be worthy of their own center stage were it not for the breathtaking Ceylon sapphire at the heart of this c.1930 ring. This is another great example of a broad gallery perfectly complementing both the center stone and the shoulders. 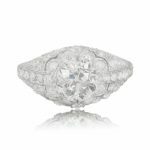 A 1.61ct old mine cut diamond sits atop a gallery decorated by incredibly fine milgrain and filigree work. The shoulders have 6 smaller round diamonds on each, cascading down to a platinum band. In all, 42 diamonds act as support and protection to the main diamond. If this were a rock concert, the old mine cut headline act would surely be crowdsurfing the fans in attendance! We’ve used a little bit of artistic license with this inclusion, but bear with us. The fact that the entire ring, from top to bottom, is just exquisite means that the engagement ring diamond shoulders themselves form but one part of an incredible piece. 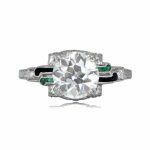 The 1.87ct old European cut diamond is prong set in a full basket setting, with 3 diamonds on each shoulder helping to frame the center stone. The shoulders, though, are part of a band that has to be seen to be fully appreciated, as any description just won’t do it justice. Handmade platinum with complex and delicate designs, together with fine milgrain all make for a ring that is just about perfect, and the shoulders are a vital part of the presentation, making the ring very worthy of being in this list. This wonderful Art Deco engagement ring from c.1925 is very unusual indeed. With a fantastic center diamond of over 2ct, where the ring really comes alive with it’s sleek shoulder accents. We often see diamond and onyx vintage and antique engagement rings, or diamond and emerald but it’s quite rare to see all three of the stones on the same ring. With diamonds along the gallery and on the shoulders themselves, the unusual shape of the onyx and diamond accents adds surprise and intrigue to the overall look and never fails to bring admiring looks (and second looks!). 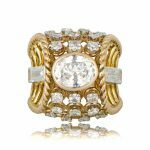 We could talk all day about this beautiful ring, noting the quality and level of skill that has gone into the design. Diamonds, sapphires and a platinum on gold mounting make it a very special piece of antique jewelry. The strong, wide shoulders not only support a lovely no-heat center sapphire and diamond halo, but they have a beauty all of their own. Sapphires set into diamond pavé and beautiful engraving along the gallery and running down under the engagement ring diamond shoulders provide a wonderful contrast to the gem stones and just looks stunning. 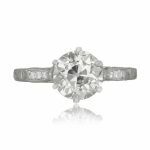 If you’re going to set a 5.12ct european cut diamond in a ring, then you’d better give it broad shoulders. An that is just what the original maker of this c.1920 colossus did. Baguette diamonds lead down to a shoulder of amazing open filigree work with added milgrain. Fortunately, the seemingly too delicate filigree is itself supported by a cascade of small diamonds on each side, giving the ring shoulders fit for a fairy-tale hero. Marquise diamonds are sadly underused in vintage and antique engagement rings, but they are a perfect match for inclusion on the shoulders, due to their elongated length. Also called Navette (French for “little boat”), the pair of marquise diamonds acts as a visual guide towards the center old European diamond. The shoulders also have several small diamonds together with hand engraving and milgrain which add depth and character to the shoulders as well as the overall ring. If you’re going to end a list, end it big! And this French creation, c.1960, is just that. This incredible ring has over 3.50ct of diamonds in the center stone and two baguettes, but the engagement ring diamond shoulders (and what shoulders they are!) haven’t been forgotten. Each is edged with twisted wire and contain a total of 20 collection-grade small diamonds. It’s a big ring to suit a big personality, and shows perfectly that, whilst inspiration is a fine thing, individuality is even better.